In a perfect world, you would only get hungry at breakfast, lunch, and dinner. In a real world, your body processes food at it’s own pace and gets hungry when it needs more fuel. You need fuel to stay alert and functioning well. When you don’t eat enough, your body will remind you with hunger pains. Rather than ignoring them, have a snack. There are things to consider when you’re going to have a snack. The most important one is are you actually hungry? A lot of health and fitness goals can get sidetracked by distracted, mindless, emotional, or overeating. Listen to your body, and see if you can feel the hunger in your stomach. If you can feel the hunger pains, reach for the snack. If your stomach doesn’t really feel hungry, drink a glass or water or go for a quick walk to take a break. Sometimes when we feel hungry, we could just be dehydrated. If you’re still not sure if you’re hungry, start by drinking a glass of water and waiting 5-10 minutes. If you’re still feeling hungry, grab the snack. 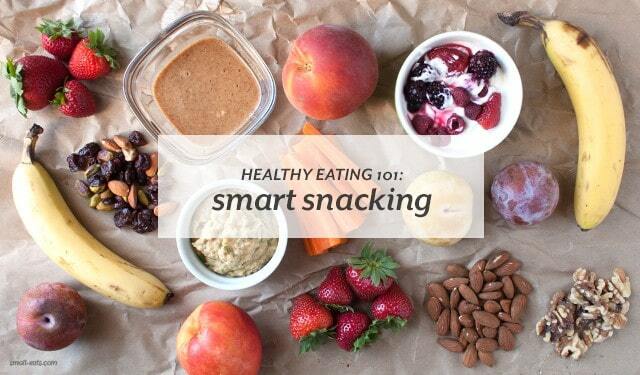 Once you know you’re hungry, it’s time to think about how you can snack smart. Snacking smart means choosing healthy foods that will keep you full and sustained. Go for nutrient-dense foods that are high in fiber, healthy fats, or protein. You can go with one food, or you can pair two foods together that, combined, are more nutrient dense. Like with your other healthy foods, go for minimally processed and refined, low to no preservative snacks. Processed and highly-refined foods will digest quickly in your body, leaving you hungrier faster and with little nutritional benefits. Here are some flexible and customizable suggestions for smart snacking. First, we’ll start with smart snacks that work well on their own. See which snacks I recommend for smart snacking on Azumio’s blog.